Kenny Stills Saints Miami Dolphins 2013 Certified Rookie Jersey AUTO RC 382/399. Shipped with USPS First Class Package. 2018 Donruss Football Base Set You Pick # 150-300 Wentz Elliott Prescott ETC. You're viewing a 2013 Score Football Kenny Still RC Blue parallel card in NM/M condition or better! 2013 PANINI BLACK ONYX KENNY STILLS ROOKIE AUTOGRAPH MATERIAL 1/5! First card in the run! Excellent cards, 2 color patch! On card Autograph! KENNY STILLS 23/50 2013 Topps Prime Level V 5 Autograph Auto Relic Quad The card in the photo is the exact card you will receive. This card will be securely placed in a sleeve and top loader. It will also be shipped in a box. As always, see photos and ask questions before buying. COMBINED SHIPPING AVAILABLE ON ALL CARDS. PLEASE EMAIL ME AFTER COMPLETING ALL PURCHASE AND BEFORE MAKING PAYMENT FOR INVOICE. Straight from The Topps Vault. Still sealed. Comes with the Topps Vault COA with matching numbers. Card will be shipped USPS First Class Postage in a padded envelope in between two pieces of chipboard, with Tracking. I charge exactly the same as the Post Office charges me, no more. Combined shipping is available. Full price for the first card, $.25 each additional card. Just wait for me to send you an invoice before paying. If you have any questions please don’t hesitate to ask. It is card # 17 in the set and is nr-mint condition or better. 2013 Panini Football Jersey & Autograph Card of Kenny Stills. This card is in NM/MT condition and numbered 97/99. Purchaser pays by paypal and adds 2.75 for P&H. KENNY STILLS 2013 CERTIFIED ROOKIE JERSEY AUTO #'rd !! NICE Rc JERSEY AUTO ! This is for a 2013 Panini Certified ROOKIE JERSEY / AUTO # 318 KENNY STILLS Rc. Card is serial #'rd 266/399. YOU WILL RECEIVE THE EXACT CARD LISTED IN THE TITLE, AND PICTURED IN THE SCAN. CARD IS IN "NEAR MINT/MINT" ( /-) CONDITION, STRAIGHT FROM THE PACK, UNLESS OTHERWISE NOTED...SEE SCAN AND JUDGE THE CONDITION & CENTERING FOR YOURSELF. CHECK OUT OUR 100% FEEDBACK, AND BUY WITH CONFIDENCE. FREE SHIPPING (USA ONLY) ON MOST OF THE THOUSANDS OF SINGLE CARDS LISTED IN OUR EBAY STORE, SO BE SURE TO CHECK THEM OUT. GOOD LUCK, AND THANKS FOR LOOKING!!! BE SURE TO CHECK OUT OUR OTHER AUCTIONS FOR MORE GREAT CARDS & SUPPLIES...ALL STARTING AT $0.99 WITH NO RESERVE! NOW OPEN.....BAKENDAVE'S NEW EBAY STORE!!!! NEW ITEMS ADDED DAILY, SO CHECK IT OUT!!!!! 2013 Sage Hit Red Kenny Stills. Product: Sage Hit. Rookie: Yes. Year: 2013. SKU: FT A0002 R01 O (3). Add to Favorites. Hand Signed: Yes. DeVante Parker - Wide Receiver - Card #282. 2017 DonRuss - Miami Dolphins - Trading Cards. Kenny Stills - Wide Receiver -Card #218. KENNY STILLS. New Orleans Saints. (Short Print Variation). I always strive to be both understanding and patient. It will be by weight of the actual item. 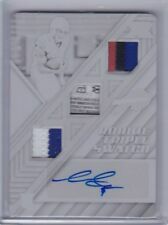 KENNY STILLS 2013 CERTIFIED RED ROOKIE JERSEY AUTO #'rd !! NICE Rc JERSEY AUTO ! This is for a 2013 Panini Certified ROOKIE JERSEY / AUTO # 318 KENNY STILLS Rc. Card is serial #'rd 098/199. #228 KENNY STILLS. 2013 PANINI TOTALLY CERTIFIED NFL. GOLD ROOKIE PARALLEL.